Gift giving is a big part of the holiday season, but it is also a tradition that calls for some special thought and care. The good news is that you don’t have to spend tons of money or fill your loved one’s home with more stuff they don’t need if you put some special time and thought into the gifts you want to give. iPod lessons. Show your favorite senior how to use their iPod. Depending on their comfort level with the technology, you may show them how to use iTunes, or you might set up a few playlists for them so all they need to do is select and hit play. This costs nothing but could make a huge difference for your loved one. Technology cheat sheets. Here’s another idea that costs next to nothing. Write out in very clear instructions how to use the iPod, how to check Facebook, or how to turn on the cable TV. Walk through the instruction sheets with your senior so you know your instructions are clear. DVD Slideshow. We know that family pictures are precious. Load up a few dozen (hundred?) into your computer, create a slideshow, add some music, and burn to a DVD. Then your loved one can just put the DVD into their player and watch all of your beautiful photos. A digital photo frame is another great way to share tons of pictures with your loved one. With caregivers, think about the gifts you can give that will take away some of the stress of caregiving. Frozen meals. New parents aren’t the only ones who love these. Make some meals that freeze well and store them single- and double-portion sized containers to be reheated quickly for an easy meal. Private duty homecare. Again, the holidays can provide a great excuse for getting your favorite caregivers started with some services they really need anyway. Private duty home care companies can provide any number of services to help seniors and caregivers get through the day, including transportation to appointments and events (or a trip to the museum! ), light housekeeping, meal preparation, or companionship for the senior so that the caregiver can be out of the house for a while. Double-Teaming. This is when you take your mom out to the movies while your son stays home with grandpa. Or you take your dad to the car show while your wife stays home to bake pies with your mom. Everyone gets some quality time together, and the caregiver gets a break from caregiving. Write down your special stories. One of the best gifts I ever got from my grandmother wasn’t intended as a gift. It was a three page essay about her experiences growing up during the Dust Bowl in Oklahoma, originally written for a researcher. I love those three pages. Something special that belongs to you or that has been in the family a long time. A favorite photo, a piece of sheet music, something you’ve kept from when you were their age – it costs you nothing, and it can mean the world to your loved one. 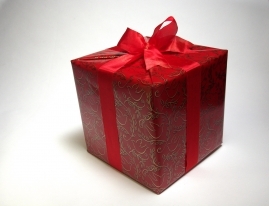 You can give a wonderful, meaningful gift this season without breaking the bank. I’ve given a few of my ideas – what are yours? Please add to the list in the comments section! These are wonderful, affordable ideas. Thank you!